…before appearing to become agitated. “If I’m being harassed by you guys, I’m out of here,” says Mason, on the recording. Mason again becomes agitated. “I’m not talking to you,” he said. “All you ever do is badger me. You should read the bullying and harassment rules in Worksafe BC. Look at Jim (Trustee Elliot), he’s rolling his eyes as usual. Here’s some comments including mine. This is the mentality in Union Bay. Dwayne Cullen hasn’t been at a UBID meeting in years so it’s safe to say he’s clueless and hasn’t bothered to pay attention. The other brainiac is proud of chasing people off his yard. These guys can never address the problems – they just don’t like people disagreeing with their friends and relatives. What is their opinion on ‘Executive’ meetings and the landowners being locked out? Uninformed and ignorant – typical Union Bay. 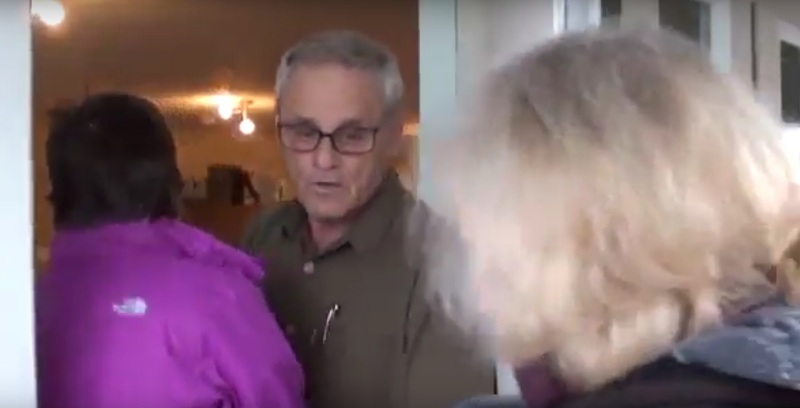 UBID chairperson Peter Jacques is pictured in a still from a video from April 9, 2018, closing the door to residents attempting to enter an “executive meeting” of the district’s trustee board. 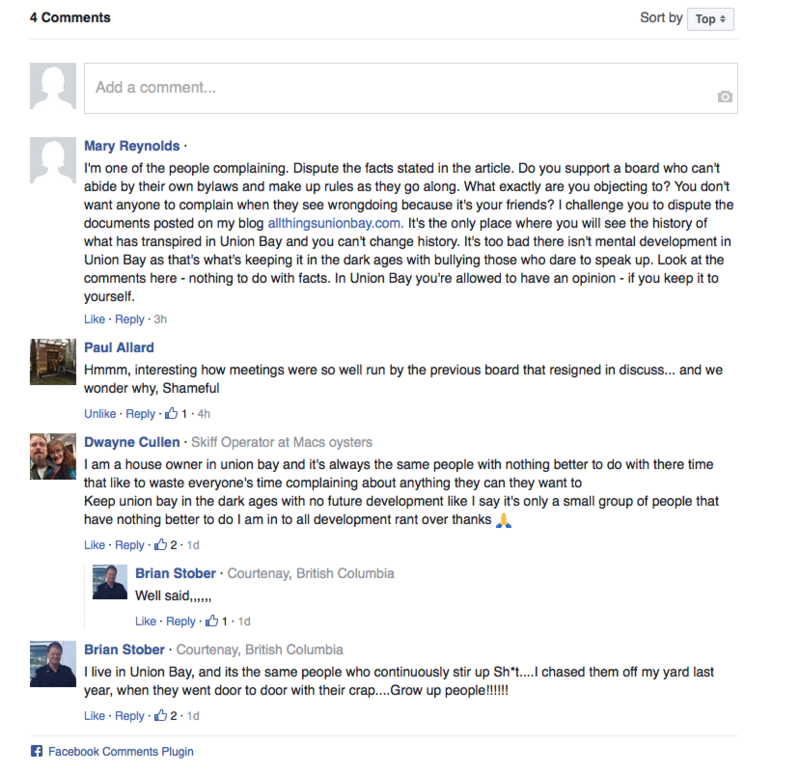 UNION BAY, B.C- Questions surrounding “executive meetings” at the Union Bay Improvement District have caused debate amongst the board in recent days. The board, which has shown division during it’s monthly public meetings, held what was described as an “executive meeting” on Monday evening down at the UBID offices. The meeting was not publicly listed on the district’s website, and not included on the list of public meetings scheduled for 2018. 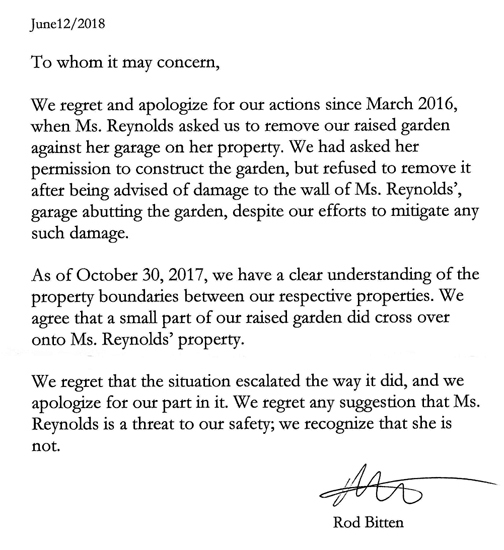 Despite the lack of public notice, a video recording sent to 98.9 The Goat by a woman named Janet Thomas, shows several residents of the area attempting to attend the meeting, and being blocked at the door by the district’s chairman Peter Jacques. When questioned on why he was preventing them entering the building, Jacques repeatedly states that the event was an “executive meeting”, and he eventually shuts the door on the residents. However, the next nine minutes after the door closed were also sent to 98.9 The Goat by Thomas, after Trustee Susanna Kaljur made a recording of the subsequent discussions between the elected officials of the UBID. According to the recording, the meeting was meant as an information session about the financial audit of the UBID, for trustees only. The meeting eventually gets underway after roughly nine minutes, which is when Kaljur’s recording ends. Throughout the recorded discussion, Jacques also mentions that there was a recording of the meeting already running, though it remains unclear how many “executive meetings” of the UBID board there have been, and where those recordings are stored. According to Jacques, who spoke with 98.9 The Goat on Tuesday, there are “procedural problems” with the UBID board. He again described Monday’s meeting as an “executive session”, meant for board members only. “What comes out of those meetings will be made public, but it’s a tool we use in order to conduct business of the board,” said Jacques. He stated that binding motions “can happen” during those meetings, which are later made public. “They’ll be reflected in the minutes, as we move forward to the next meeting. They’ll be brought forward”. When asked how many “executive meetings” have been held by the UBID board, Jacques said there had been several, though he couldn’t provide an exact number. He did confirm that business had been conducted at those meetings. According to the UBID bylaw on meeting procedures, committee of the whole meetings can be held from “time to time” for urgent matters requiring a board decision outside of the regular schedule of meetings. Any matters decided at committee of the whole will be re-confirmed at the next regular meeting. There is no reference made to “executive sessions” in the UBID procedure bylaw for meetings. Reached on Tuesday, Mason declined to comment on the matter, saying he was “waiting for more information” and would be able to talk in a week. While the office of the BC Ombudsperson could not discuss any complaints made about the UBID government, they did confirm that five files have been opened by their office in the last fiscal year regarding the improvement district. Three of those files have since been closed, with two open as of March 31, 2017. 98.9 The Goat has reached out to the Ministry of Municipal Affairs for further comment on this story. The recording made by Kaljur can be heard here. A partial transcription is included below. Both Kaljur and Trustee Jim Elliot are heard on the recording disagreeing with the shutting-out of the public, directing questions towards the UBID’s administrator, Gordon Mason. Mason tells both the trustee’s that he had spoken with Simon Rasmussen at the provincial Ministry of Municipal Affairs. According to Mason, the ministry “didn’t say that they couldn’t have the meeting.” “Because of what’s been going on in our area, means that we can’t have a meeting to be able to discuss things without this stuff going on,” says Mason, on the recording. “Without people screaming at each other, without shouting from the public.” Mason initially tells Kaljur and Elliot he could provide Rasmussen’s last name at the end of the meeting, before appearing to become agitated. “If I’m being harassed by you guys, I’m out of here,” says Mason, on the recording. “I’ll get his name for you, sure. You guys harass *unintelligible* Jim (is) telling me to leave the meeting.” Kaljur repeatedly expresses her concerns about the meeting being illegitimate, and eventually tells Jacques she’ll make a “formal complaint” to which he tells her to “go for it”. (The) reason why we have to go to an executive meeting is primarily your actions, Trustee Kaljur,” said Jacques. “First of all, the second meeting that you attended, you kept interrupting me as chair.” Kaljur asks for dates. “I’m not going to give you a date, because I don’t remember the date. 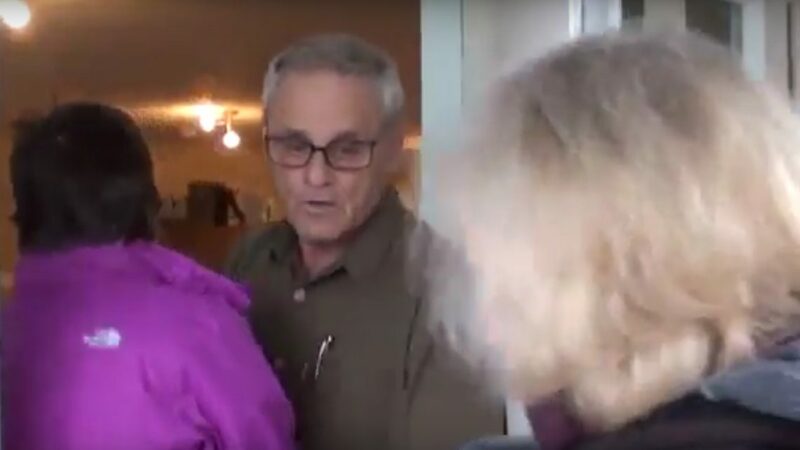 I had to ask you to leave, you refused to leave, and I had to close the meeting.” Jacques also mentioned an occurrence where Kaljur had read out an email sent to her by Trustee Glenn Loxam, as an example of Kaljur’s actions leading to “executive meetings”. Eventually, Kaljur returns to question Mason about what he was told by the province about the meeting and its legitimacy. “What did the Ministry tell you? That you could exclude the public? Why?” says Kaljur, roughly six minutes into the recording. Mason again becomes agitated. “I’m not talking to you,” he said. “All you ever do is badger me. You should read the bullying and harassment rules in Worksafe BC. Look at Jim (Trustee Elliot), he’s rolling his eyes as usual. We’re here to have an executive meeting, to talk about the budget.” More back and forth between Jacques and Kaljur ensues, with Jacques eventually mentioning the practice of “executive meetings” coming from a lack of work getting done in public meetings. “The reason why we’re having executive meetings is that we don’t have to go in-camera, necessarily, for information that is discussed at executive meetings, although we may be able to do so,” said Jacques. “These are the (reasons), but also because we cannot get any business done, at these public meetings.” In response to that, Kaljur asks what he is basing his opinion on. “Based on what I just outlined to you, about your actions, ok?” said Jacques. He also mentions he had asked for Kaljur’s resignation, which she had failed to give. “Nevertheless, it’s there,” said Jacques.